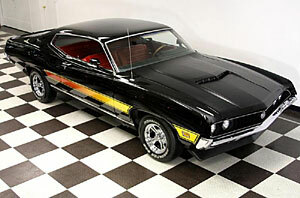 FANTASTIC JET BLACK 1971 TORINO GT WITH A 351 CLEVELAND WITH BILL OF SALE WINDOW STICKER AND CERTA CARD. This is an original numbers matching GT with the famous 351 Cleveland engine. The car comes with the original window sticker, bill of sale and factory warranty Certa card. 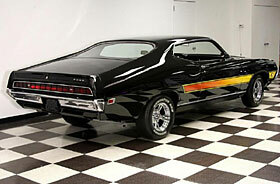 This black street beast has bright yellow and red factory laser stripes. The sharp contrast of colors make this a car stand out in the crowd. 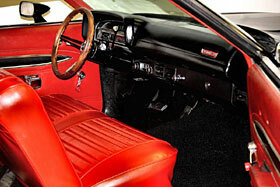 The matching red interior it sets itself apart from the others. Under the hood this car is very nice and loaded with the #�s matching 351 Cleveland, Power steering power disc brakes and factory complete AC that needs serviced. The car has color-keyed racing mirrors, GT rocker panel moldings. Paint on the car is very nice and the stripes and integral hood scoop give it that GT the menacing look. The red factory interior is in great shape and has new carpet, new seat covers, original factory AM radio and sharp new wood steering wheel. The body structure is very sound and has new factory style performance mufflers that provide that muscle car sound.